In this particular section we're going to talk about how you can manage your furrow irrigation system to minimize how much water goes down through the profile taking nitrogen with it into the groundwater supply. Our goal of our particular operation here is to apply the right amount of water, and to do it as a uniformly as possible, so that we meet the crop water needs and minimize how much water leaves the field as runoff, how much water will make its way as deep percolation down through the soil profile. By so doing we're gonna minimize how much nitrogen is least into our groundwater supply. Soil infiltration refers to the soil’s ability to allow water movement into and through the soil profile. It allows the soil to temporarily store water, making it available for uptake by plants and soil organisms. The infiltration rate can be restricted by poor management. Under these conditions, the water does not readily enter the soil and it moves downslope as runoff or ponds on the surface, where it evaporates. Thus, less water is stored in the soil for plant growth, and plant production decreases, resulting in less organic matter in the soil and weakened soil structure that can further decrease the infiltration rate. We will explain about what influences infiltration is a uniformity of water aplliction with free or irrigation. Well certainly the first thing is how fast is water advance down through the furrow from one end of it to the other, this is referred to as the advance time, so the minute you turn on the water if you were to record the time and you were to record the time when water got to the other end of the field that's advance time, how fast does it take how much time does it take water to move from one end of the field to the other. Soil texture and Level of Compaction. Because the infiltration rate of our soil is dictated largely by our soil texture, so if we have a sandy soil for a given time frame we're going to have more infiltration in the sandy soil than we will in a silt loam soil under the same conditions. Level of compaction if we irrigate a row that we drive our tractor and our planter down all the time, we're going to have less water infiltrating into that particular soil because the compaction restricts water movement into that soil profile. 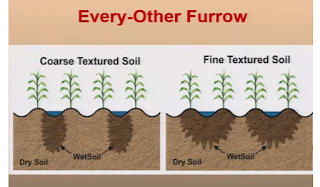 Consistency of Furrow Slope. Furrow slope is a real issue here particularly over time if we've done some land leveling out there in the field some time in the past it's not uncommon for some of those areas where we did of it we filled in some low-lying areas for us to have some low-lying areas again and we end up with areas of reverse grade and water tends to build up more there than in other places, it slows down the advance time and it causes water more water to infiltrate in that particular point in time. The length of the furrow. It's going to take water to get to the end of that particular furrow and certainly there is a limit in terms of how we manage our systems as to how long these furrows really should be to do a good job of managing our surface water application. Tillage and residue management. 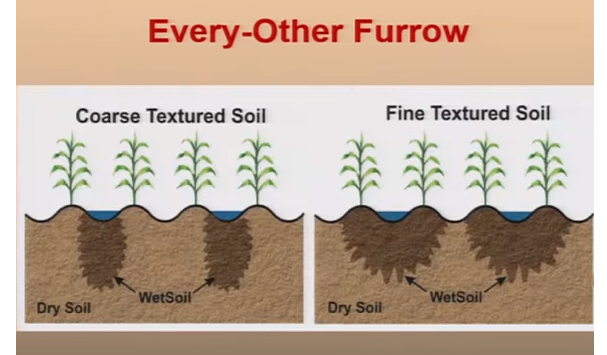 Now as we look at the changes of happen over time the the reduction of tillage and residue management practices actually have not necessarily been a positive for furrow irrigation, the residue that we have in our corn rows causes little dams to be created and slows the water down. lack of tillage actually causes the infiltration rate to go up and so we have more water infiltrating due to both of those practices than we had back in the day when we did plowing and all that other kind of tillage, positive in a long run but negative when it comes to surface irrigation. When we talk about uniformity what we're talking about if this is a field of corn from one end of the road to the other and we're turning water in from our pipeline here on the left-hand side, water is going to drunk run down the furrow all the way along here and depending on how long we irrigate, we're gonna fill up the storage capacity of the soil water in our field that we're going to irrigate and if we do a poor job of uniformity we're going to have water that's going to infiltrate and pass down through the root zone and make its way down to the ground water. Now if we have a good job we're going to control our set time in our stream size so that water gets to the end of the furrow here and we don't over irrigate to the point where we have this area down here that's filled up and likewise if you see the red area here along the furrow we have a minimum amount of water that actually makes its way through the profile cell. So the uniformity is affected by both these stream size and the set time that we have out in the field in addition to the length of the furrow. So we run into different kinds of field situations out there with different fields, and one rule of thumb, if we have a situation where we have a reuse put where the water from all all the runoff water from the end of the field runs into a pit like this, stored there and we reuse it to irrigate the the same field or some other field then what we'd like to see is is to use an advance rule that looks like this. basically what we'd like to have is that the average Perl advanced time should be less than one half of the overall irrigation time. So if we're going to irrigate for twelve hours we'd like to see the water advance to the end of that furrow be less than half of that so might be five hours it might be four hours of the total set time. What that does then is it causes the water infiltration to be as uniform as we can get from one end of the other and it's actually going to result in some runoff and in the particular case of uniformity of irrigation with the furrow system, it's important that we have surface runoff from the perspective and uniformity if we're not reusing it then that's a different story but this reuse pit allows us to catch the runoff and use it. Well we don't have a reuse pit and water comes down to the end of the field and may drain off the field and into the road ditch or off the field in some other some other place or just infiltrate right there on the end of the row, well we'd like to see here now is that we use a 3/4 plus rule. what means that we get water to the end of the furrow in about 3/4 of the time and then we're going to irrigate the rest of the set time - to get uniform water infiltration all the way along so we get watered down to this point with 3/4 of our irrigation time and then the rest of the set time the whole field is being irrigated all at one time. Now one of the other things we run into is that we don't want to have water leave the field because there are some rules associated with that and some producers are using block and furrows to get this this kind of thing done, which means that basically if you look at the end of the furrow there's a you block the end with a dyke on the end of the the furrow that you see here on these two, and what we're doing now is we're we're running water from one end of the field to the other we're filling up the most of the stored soil water the capability there if we have this situation where we poorly managed where the set time is too long and the stream size might be a little bit small or too little for that particular field installation, we're going to get some deep percolation here and again too long a set time is going to have a situation where we have deep percolation here at the end. If we manage them appropriately with the right stream size and set time now we're filling up this profile and we might get a little bit of deep percolation here in the upper end we're going to have a little area here that's not going to get refilled at the far end and you can see here that even though we had the dyke on the end of the furrow here, we're not getting a lot of additional over irrigation here at this particular point. So the rule of thumb here for blocked and furrows is basically the same as what you would run with a regular one is the 3/4 plus rule where we get water to the end of the furrow in about 3/4 of irrigation time and then we finished out the irrigation event just like we were before, and what this does then again is it makes that water infiltration as uniform as we can get and it doesn't allow a lot of water to accumulate down here on the outside of this dyke. So, what is the potential impact of the length of run we mentioned that some furrow links might be a little bit too long and so what you see underneath here is an infiltration pattern for a half mile rows and you can see that with a set time we're going to fill up these this soil water holding capacity here as we go from one end to the other but because the set time or the the furrow length is too long we're going to have considerably a lot of extra infiltration here in the upper end and gradually over to the to the far end of the field. Now if we split that same length of furrow in half, we fill up this profile and you can see here that we might still have some deep percolation loss in the upper portion of the field, but now we're conserving all this water that's represented by this shaded area that's below of these particular graphs, and so the the implementation of half of the row length here is really going to conserve a lot of water in the long run and the other part of this is of course that it's not going to transport and nearly as much nitrogen down through the soil profile and into the groundwater. So what can we do with management now to improve our situation out there in the field in terms of how we manage the water applied with the furrow irrigation system. Well first of all we can apply water and every other furrow. What amounts to here is that water is applied on down one particular furrow and the plants on either side of it have equal access to that water. Takes less time to irrigate field. Because we're only watering a portion of the field it takes less time to get that water to the end of the furrow. Applies less water per irrigation. Reduces total water application 20 to 30%. Leaves more room for storing precipitation. This is something that's really key in this particular management category because we're only watering or wetting up about half of the soil surface. so the rest of that soil surface is going to be as dry as it is between precipitation events. the plan itself is not going to experience that dryness but there's room to store water that we might get in terms of precipitation and make better use of it in long run. Research has proven yields comparable to every furrow irrigation. It would suggest that utilizing every other row furrow irrigation does not really impact yields much at all, and so they're very comparable and utilizing this is more of a water conservation a water quality some kind of practice that is very good for us in the long run. So take another look at this and they do add soil texture to it the image on the left over here if we've got a sandy soil, there's two parts of this that's in that are important we have every other row that we were just talking about, but our sandy soils now gravity is going to pull that water more directly downward and capillary movement is not going to allow it to move very far to the left or to the right that you see here and so we get an elongated wet soil pattern here and if we go the same scenario with a fine textured soil now you can see here that we still have the vertical movement but we have horizontal movement as well due to the fine textured soil and the ability of that soil to transmit water away from the water source and into the dry soil kinds of conditions. so in the long run here we have to do a much better job of managing our water supply during with a coarse textured soil and when we do with the fine textured soil partially because with the same practice we're going to get water moving down through the profile not the bottom much more rapidly than we do with with a silt loam soil. So as we look at again the impact of tillage on our infiltration rate and there's two things on this particular graph one is the tillage practices are there and you can see by the different colored bars what we're looking at here from the from the no-tail to the ridge tail to the conventional tillage where we might be disking or going through with with the tiller there. Any other part of it is is that the there's two irrigation events here, the first one the other year is always the one that's going to take the most water and then later on in the growing season that that soil surface becomes conditioned a bit and none of them take as much water as they did the first time so again now as we look at our tillage practices part of this is due to the fact that we're not tilling this particular soil and the other part of it is, is that there's residue that is on that surface causing the the advanced time to go up quite a bit. now when we Rich till here now we're we're creating a scenario where some of that residue is still there in the middle but some of it has moved out of the furrow as well and it allows that water to move down and with the conventional system by and large what we're talking about here is that we're actually incorporating that residue into the soil surface. You notice that there's a reduction in in the overall depth of application after six hours here for all three of these because that's all a surface becomes conditioned over time. Now one of the things we look at here in terms of the advantage to different management and equipment it's available for surface irrigation would be that we're looking at here a surge irrigation system in that we can potentially reduce deep percolation we can manage our surface runoff because we can control the the inflow of water into that and I'll show you that in a minute we can improve our uniformity over time and overall improve our irrigation efficiency on some field condition. So when we look at this from an advanced phase that we talked about earlier, advanced cycles to move the water to the end of the furrow and a soak phase basically is to have water on that surface for the whole length of the furrow so that it will infiltrate at the same rate. So take a look at this on this side we have our our gates open and you can see by the blue here that we got water moving down through our down through our field and the surge one and what happens now is that the ones on the right-hand side that we're running now turned off and the ones that are over here on the left-hand side are turned on and you can see we get water moving down that particular referral. We go back and forth here and tell about the surge number four we hopefully have got water down to the end of the row on both sides of this particular field and in the process we've got that water down there more rapidly than what we would before. So pictorially this is what it might look like we get about 25 percent of the time with surge number one half the way in search number two, three-quarters of the way in surge number three, and all the way to the end and surge number four and then we're going to go into a soak phase where we have some surges again that are going to cause water to infiltrate as uniformly as possible. We compare that with with the continuous inflow of water that you see here and you see this graph looks like this you can see here that we have more water infiltrated in essentially the same period of time with a conventional system with continuous inflow only using the surge and that's the whole idea here is the minimum reduce the amount of water we turn out into this furrow and try to improve the pran the uniformity from one end of the furrow to the other. The other thing we want to mention and be concerned about a little bit here is that we have leaky gates and gaskets on some of these furrow irrigation systems or water leaks that every one of them and so what ends up happening here is we're reducing the overall water use efficiency because we can't open as many gates because water is lost and in the transport it takes more sets because of it, we require more overall pumping to meet the quality water requirements of the crop and we look at this at the end of the year then we're going to potentially have some leaching loss at the top of the field and as you go along the pipeline from the particular source out to the field itself. 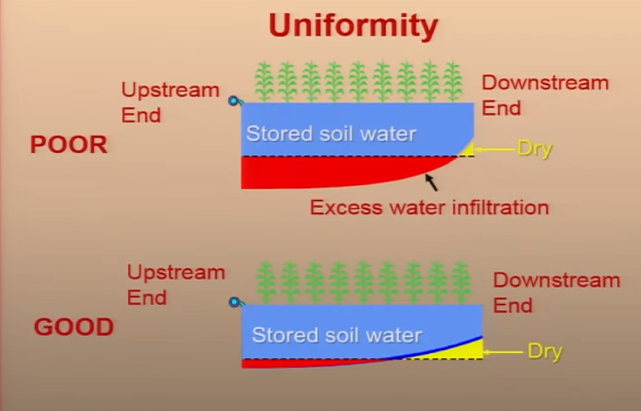 So we summarized these kind of things the selection of the correct stream size and set time will minimize the amount of water that goes into deep percolation and surface runoff and in the process we're going to minimize how much nitrogen is lost in the leaching process. The surge irrigation equipment can help improve the overall water infiltration uniformity if we look in really high intake soils. If we go to some of our fine textured soils with these surge systems we may run into some issues if we're not careful. 0 Response to "Furrow Irrigation System"